The other day my bloggy friend OHMommy posted all about Polish Christmas traditions. Traditions that we also partake in on The Avenue. Traditions that I hope my children and grandchildren will continue to celebrate. Today I'd like to share one more Polish tradition with you. 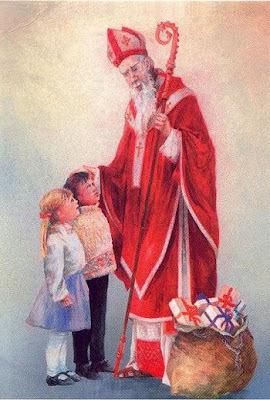 On St. Nicholas Day, in the very early morning of December 6th, the children are surprised by small gifts left in their shoes by Sw. Mikolaj (me co' why). In Poland, Sw. Mikolaj is not a big chubby guy with a red Santa hat , red Jacket, and riding boots. Instead, he is a saintly, more dignified figure, dressed in the regal red and gold robe, wearing a cape and bishops miter, and carrying a crosier (a crooked staff, the symbol of a bishop, as the shepherd of his flock). Sw. Mikolaj was revered because of his compassion and love for orphans whom he often visited and comforted with little gifts. He travels the countryside on foot, or occasionally on a white horse, blessing the children, and distributing goodies from house to house to well behaved children. Sw. Mikolaj does not live at the North Pole, but up in Heaven. Sw. Mikolaj is called the “Father of Christmas”, known to children in America as “Santa Claus”. 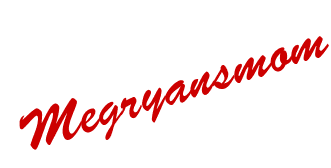 and thank you Dear Readers for being here for my 1st 100 posts. What a neat story about St. Nicholas day! I love learning about traditions...much more deeply rooted than our very young "Americanized" version of things! And in Holland they also get treats left in their shoes, by Sinteerclaus, who also looks quite a bit more like your picture above. But apparently he just comes up from Italy lol. oh and congrats on 100 posts! that is the BEST pronouncation. Cool! We got to learn something cool today! Merry Belated SITSmas! Is the eggnog all gone? Ok,happy 100, too! I'm almost there! I love the traditional stuff! I would have guessed you had way more than 100 posts! You're a blogging machine!!! Congratulations on the 100th post. Thanks for sharing the polish traditions.